One of the issues I encountered early on in migrating my Docker Swarm workloads to Kubernetes on GKE, was how to reliably permit inbound traffic into the cluster. There were several complications with the "traditional" mechanisms of providing a load-balanced ingress, not the least of which was cost. I also found that even if I paid my cloud provider (Google) for a load-balancer Kubernetes service, this service required a unique IP per exposed port, which was incompatible with my mining pool empire (mining pools need to expose multiple ports on the same DNS name). 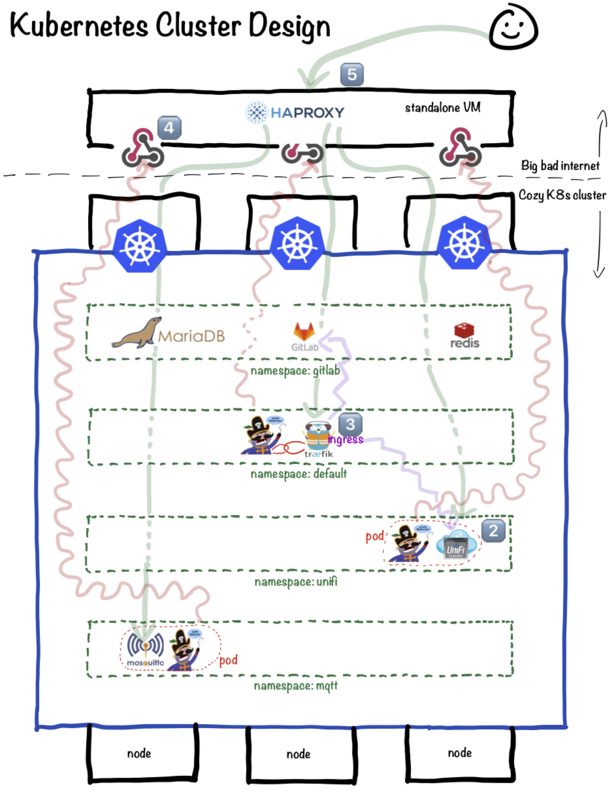 See further examination of the problem and possible solutions in the Kubernetes design page. This recipe details a simple design to permit the exposure of as many ports as you like, on a single public IP, to a cluster of Kubernetes nodes running as many pods/containers as you need, with services exposed via NodePort. Safety first, folks. You wouldn't run a webhook exposed to the big bad ol' internte without first securing it with a valid SSL certificate? Of course not, I didn't think so! Use whatever method you prefer to generate (and later, renew) your LetsEncrypt cert. The example below uses the CertBot docker image for CloudFlare DNS validation, since that's what I've used elsewhere. Why use a wildcard cert? So my enemies can't examine my certs to enumerate my various services and discover my weaknesses, of course! Once you've confirmed you've got a valid LetsEncrypt certificate stored in /etc/webhook/letsencrypt/live/<your domain>/fullcert.pem, proceed to the next step..
We're going to use https://github.com/adnanh/webhook to run our webhook. On some distributions (❤️ ya, Debian! ), webhook and its associated systemd config can be installed by running apt-get install webhook. We'll create a single webhook, by creating /etc/webhook/hooks.json as follows. Choose a nice secure random string for your MY_TOKEN value! Note that to avoid any bozo from calling our we're matching on a token header in the request called X-Funkypenguin-Token. Webhook will ignore any request which doesn't include a matching token in the request header. This section is particular to Debian Stretch and its webhook package. If you're using another OS for your VM, just ensure that you can start webhook with a config similar to the one illustrated below. echo "HAProxy validation failed, not continuing"
echo "HAProxy config has changed, reloading"
Whew! We now have all the components of our automated load-balancing solution in place. Browse to your VM's FQDN at https://whatever.it.is:9000/hooks/update-haproxy, and you should see the text "Hook rules were not satisfied", with a valid SSL certificate (You didn't send a token). Does the webhook verbose log (journalctl -u webhook -f) complain about invalid arguments or missing files? Is port 9000 open to the internet on your VM? Still with me? Good. Move on to setting up an ingress SSL terminating proxy with Traefik..